Here’s another wonderful reunion story! She came bolting in our bedroom this morning with Mimzy in tow. She was so excited she was yelling and jumping around, and we couldn’t even understand what she was saying. Mimzy went to dance class this morning, where she joyfully told all the other kids and teachers about Mimzy’s adventures. Then she went to lunch with us…the ladies at Panera Bread thought she was the cutest thing as she shared the tales of her lost bunny. Mimzy has not left her side since this morning. At one point she did say that Mimzy looked like he was a different color. I retold the tale of the bunny spa that’s located in the center of Paris…. We checked the suitcase and sure enough there was an Eiffel tower sticker. She smiled and continued playing. Phew! Operation “FIND MIMZY” has been successful. Again, I can’t thank you enough for bringing such joy to my little girl and my family (her 9 year old twin brothers were just as happy to see Mimzy!) Good things come to good people, and I hope someday a small favor is returned to you from a stranger. My daughter lost her lovey recently in a department store, and it never turned up in lost and found. I’ve looked high and low for a replacement. We bought in in the dollar bins at Target about 2 years ago during the Easter season. 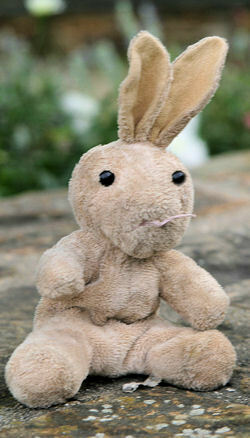 It is a beige bunny rabbit that is about 5-6″ tall without the ears. Its ears stick up from the top of his head, adding another 1.5″ or so. He has black eyes and pink thread for a mouth. With Easter coming up I’m hoping someone taking out decorations will come across this bunny and would be willing to help. For days now, my daughter has gone to bed with such sadness it just breaks my heart. When she visits the Easter Bunny she’s going to tell him how sorry she is that she lost him (it was in her Easter basket). She doesn’t want any candy or any toys or anything…she only wants another “Mimzy”, which is the name of her lost bunny. This is an amazing site you run and I’m sure you find it really rewarding….I can only imagine how many children you have all helped!!! I could’ve sworn I saw this bunny before and I’m glad I haven’t lost my mind. I found it! Maker is All Wrapped Up, tag on left leg, 6 inches without ears, 8 inches with. Round little tail in the back, perfect condition. Email me at recis77 at yahoo dot com for pics. Lori, check your email. I sent you picture of the bunny. Lori! I sent you a comment before but I don’t think it went through! My name is Elissa and I have your bunny right here in my hand! I got him at a huge bargain sale, recognizing him right away as your daughter’s Mimzy, only not the exact same bunny she lost at the store. My email is elissachan AT icx DOT net — please email me as soon as you can, I’ll do whatever I can to get you this bunny! Thanks for your time.